Reservoirs and dams are created for catering to the need of agriculture, industries, domestic etc as a continuous reliable source of water. Among other uses, power plant (PP) cooling water system (CWS) needs reliable and continuous supply of water and hence reservoirs are used, for the same. All equipments in contact with cooling water can be maintained through regular inspection and monitoring programmes such as study of water chemistry and biological population of the reservoirs. Water chemistry monitoring includes the concentrations and pattern of fluctuations in chemical constituents and the responsible physical and biological parameters. This information is used to predict future trends in reservoir chemistry and to identify any potential for affecting plant operation so that remedial action can be taken before any damage or increase in operating cost occurs. Fig. 1. Open reservoir showing input of Palar sub-soil water and luxuriant growth of macrophytes. An open reservoir located (Fig. 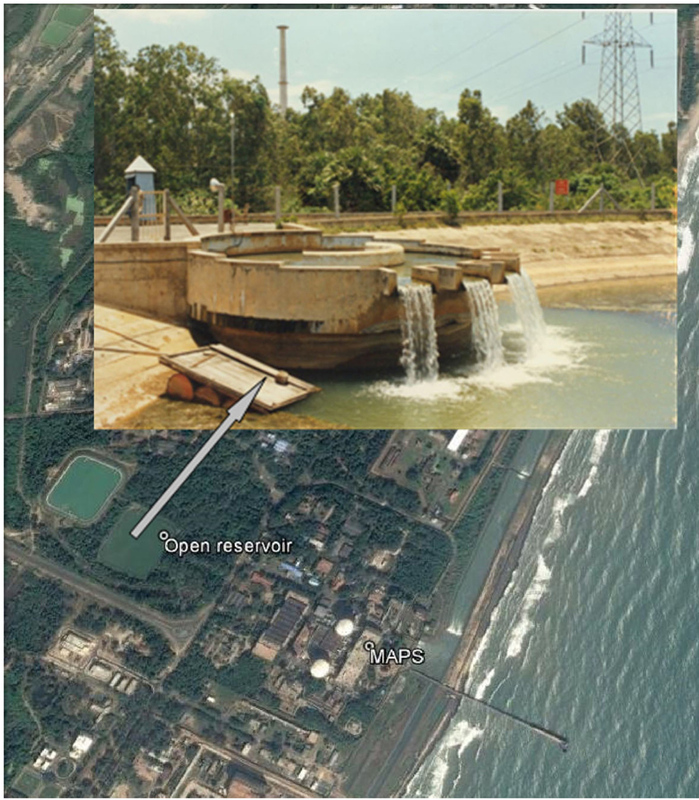 1) near Madras Atomic Power Station (MAPS) at Kalpakkam (12o 33’N and 80o 11’E) is used as a reliable storage facility to meet the needs of fresh water requirement of (a) condenser cooling water for the Fast Breeder Test Reactor (FBTR), (b) DM plant of MAPS and (c) various laboratories situated at Indira Gandhi Centre for Atomic Research (IGCAR), Kalpakkam. The water is collected from Palar river bed through infiltration wells located about 20 km away from Kalpakkam and is transported to the reservoir through a 60 cm diameter cast iron pipe. Palar River does not hold surface water and thus, sub-soil water is collected through infiltration wells. The reservoir has a volume of about 30,000 m3, spread over an area of about 2 ha and has a maximum depth of 3 m. The reservoir is now about 40 years old. The reservoir sustains massive growth of macro vegetation throughout the year. Cooling water system of FBTR had experienced various problems like flow blockage of pipes, strainers and valves, pipe punctures and corrosion. Moreover, the demineralization (DM) plant at MAPS and FBTR faced early exhaustion of ion-exchange capacity. The present investigation consisted of analyses of important water quality parameters (temperature, pH, conductivity, dissolved oxygen, and chlorophyll-a.) for both sub-soil river water and open reservoir water for five years to have a comprehensive assessment about the suitability of open reservoir water for potability as well as for cooling water purposes. Results of the study revealed, an increase in pH, temperature, DO, Chlorophyll a, dissolved organic matter and chlorine demand, and decrease in nutrient contents from Palar sub-soil to open reservoir water. Higher pH observed in the open reservoir water as compared to sub-soil Palar water is apparently due to photosynthetic activity by phytoplankton and macrophytes. Photosynthetic activity leads to the following reaction. As plants remove carbon dioxide for use in photosynthesis, carbonate accumulates and subsequently undergoes hydrolysis as follows. The accumulation of OH– pushes the pH of the reservoir water up. The efficiency of a biocide like chlorine, used in the FBTR cooling water system for biofouling control, apparently gets reduced at higher pH due to decrease in HOCl content. During chlorination of cooling water, hypochlorous acid (HOCl) is formed (C12 +H2O = HOC1 +HC1) and is the main disinfecting agent. At higher pH, (>8.5) most of the HOCl remains in OC1– (95%) form, and OC1– is 50 to 100 times less effective than HOCI. In addition, increased pH facilities deposition of hardness salts resulting in scale formation, leading to reduction in heat transfer efficiency across heat exchanger. Thus, pH control is essential for control of scaling and biofouling. Since oxygen is the by-product of carbon assimilation, photosynthetic activity in the open reservoir water increased its dissolved oxygen level and possibly caused corrosion in carbon steel pipe line in FBTR cooling system, as elevated DO levels are known to accelerate corrosion rate. Fig. 2. Variations in pH, dissolved oxygen (mg l-1), chlorophyll-a (mg m-3), total organic carbon (mg l-1) contents in the open reservoir and Palar sub-soil water. High nutrient content observed in the Palar sub-soil water is possibly due to the fertilizer runoff from the nearby agricultural land which uses phosphate and nitrogen based fertilizers. Significant reduction in phosphate and nitrate concentration from Palar to reservoir water is due to their utilization by microorganism and macrophytes (Vallisneria, Najas and Ceratophyllum) present in the reservoir water. 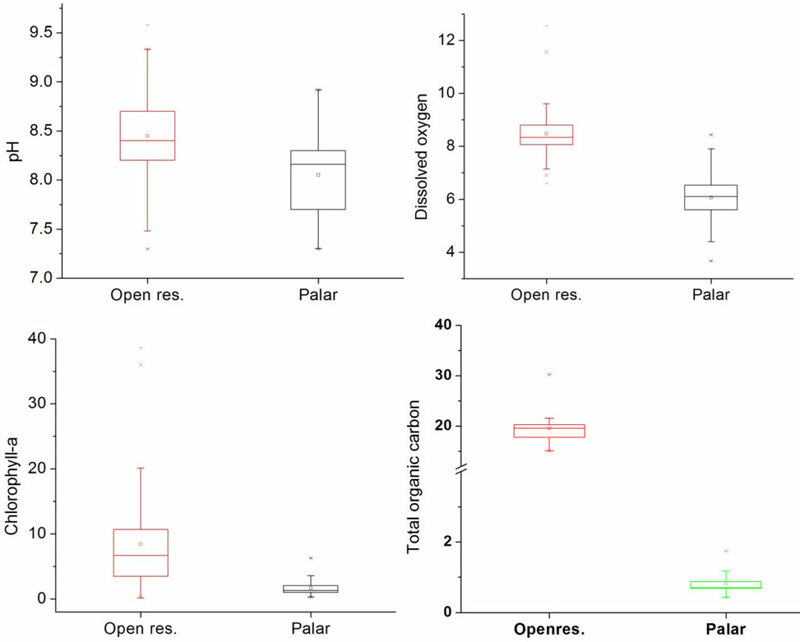 Increased biological activity also lead to increase in chlorophyll-a as well as dissolved organic matter (DOM) content in the open reservoir (Fig. 2). Very large microbial population was also observed in the reservoir which could have enhanced Microbially Induced Corrosion in FBTR cooling water system. Presence of relatively high concentration of reactive silica in both the water lead to the formation of high molecular weight non-reactive colloidal silica which apparently was responsible for blocking the ion exchange sites beds in MAPS & FBTR demineralizing plant. Increased DOM might also be responsible for the loss in efficiency of anion exchange resin MAPS & FBTR. It is inferred that, sub-soil water with higher nutrient concentrations when stored openly, exposing to the Sun, resulted in growth of plants, planktonic as well as macrophytes, that led to substantial deterioration in water quality with respect to its use as a condenser cooling medium, raw water input for DM plant as well as drinking water and thus needed appropriate treatment. Changes in sub-soil river water quality upon its open storage-a case study.